Approximately 10 percent of Americans suffer from pet allergies, according to WebMD. Cats are twice as likely to cause allergies than dogs. If your infant is suffering from cat allergies, chances are it runs in your family. If one or both parents are allergic to pets, the risk of their child developing the condition significantly increases, points out The Asthma Center. If you suspect your little one might be allergic to cats, learn the symptoms so you can take appropriate action. It's not your cat's fur that causes allergies, but proteins found in her saliva, urine, sweat and dead flakes of skin, or dander. 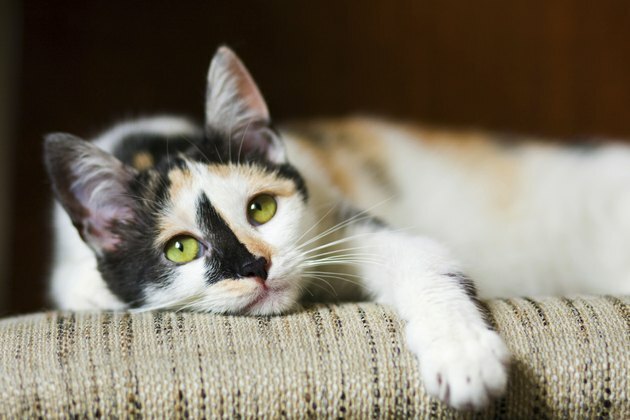 Even if you own a short-haired cat, she can shed as much dander and other allergens as long-haired breeds. The immune system in allergy sufferers falsely interprets dander and other harmless substances as harmful invaders. As a result, the immune system tries to protect the body from this perceived danger by releasing antibodies, producing inflammation in lungs, eyes, nasal passageways or on the skin. When an allergic infant comes into contact with cat allergens, her immune system releases more than 40 chemicals, including histamine, according to BabyCenter. Cat Allergies or Common Cold? You might wonder if your little one is allergic to the cat or suffering from a common cold. Cat allergy symptoms can include frequent sneezing, coughing, itchy eyes, congestion and a runny or stuffed nose. Colds typically last for three days to around one week, although some symptoms can linger for a couple more weeks, according to WebMD. If your infant's symptoms begin to lesson after that time, she most likely just had a cold. Allergy symptoms will persist for as long as your infant is living with the cat. Because cat dander can easily travel throughout your home, your infant can develop symptoms even if the cat is confined to another room. Cat dander can circulate through heating and ventilation systems, and remain airborne for long periods of time. It also collects in curtains, carpeting, toys, stuffed animals, furniture and clothing. Allergic asthma is the most common type of asthma, according to WebMD. When your little one inhales cat allergens, his airways can become inflamed and produce thick mucus. Asthmatic symptoms include tightness in the chest, cough, difficulty breathing and wheezing. Asthma often becomes worse at night and your little one might have trouble sleeping due to shortness of breath. During an asthma attack, it's often more difficult to breathe while lying down.Avoid waiting if your infant displays asthmatic symptoms -- take him to a doctor or an emergency care facility immediately. Your little one adores Kitty and shows it by kissing, hugging and petting her furry friend. Problem is, when the cat allergens come into direct contact with her skin, she might develop hives, redness or eczema. Eczema is a skin condition that causes raised patches of inflamed skin, often with severe itching. Newborns who live with a pet cat are more likely to develop eczema than other babies, according to WebMD. In extreme cases, fluid-filled blisters appear that develop crusts. Even an affectionate lick from Kitty can cause a skin reaction in an allergic infant. Take your infant to an allergist who will conduct skin tests to determine if she's allergic to cats. He might prescribe medication to treat the symptoms and offer suggestions to help manage the allergies. Allergy shots can reduce the severity of symptoms over time, but are unsafe for kids under age 5, according to WebMD. If the cat allergies are severe, your best bet is to give the cat up for adoption to protect your infant's health. Keep in mind that even if you remove the cat, it can take up to six months to lower the allergen levels in your home and notice a lessening of your infant's allergic symptoms, according to the KidsHealth website. KidsHealth: If My Child Has Asthma, Can We Keep Our Pet? WebMD: Is it an Allergy -- or Just a Cold?